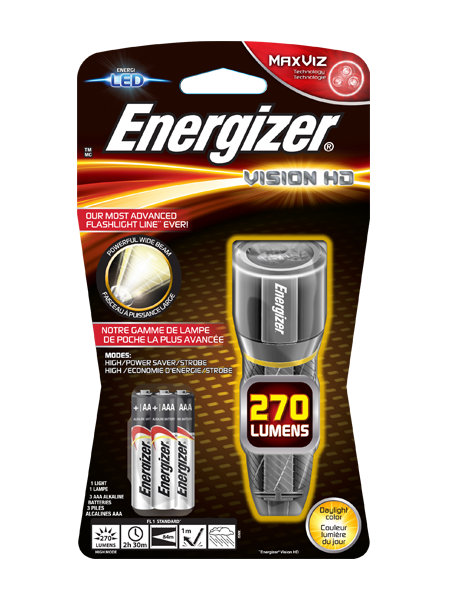 The Energizer® Vision HD Compact light delivers high-performance innovation in a convenient size. Designed to fit in your vehicle, pocket or bag, the Energizer Vision HD Compact is perfect for a wide variety of tasks. Unique MAXVIZ technology delivers a wide, powerful beam that provides users sharp, high-definition vision. A smooth, digital switch provides access to multiple beam settings: high, power saver and emergency strobe modes. Featuring an advanced alloy construction, the Energizer Vision HD is a durable solution that delivers powerful daylight-colour illumination at home or on-the-go.